Cars "Bedford" belong to the most famous English trucks, although neither in appearance nor in originality of design, they were never distinguished from all other cars. In practice, these were universal and unpretentious "workhorses" that could be found anywhere in the British Isles and around the world. The first years of Bedford's existence are connected with the well-known machine building and iron foundry company Vauxhall, founded in the middle of the last century in the Vauxhall quarter in London. In 1905, she moved to the city of Luton, County Bedfordshire, where she began to produce cars. In the difficult 20-ies for the company, the American concern General Motors, which long ago intended to create its own bridgehead in the UK to invade the European market, became interested in Vauxhall and in 1925 made it its British subsidiary. The plans for securing the European market also covered the truck sector. Activities in this direction began with the import of Chevrolet trucks to the UK, and at the end of the 1920s, assembly was started at the Hendon factory. In 1931, the American leadership decided to deploy in the country its own production of light trucks, adapted to the requirements of the British market. Their brand was "Bedford" - by the name of the neighboring town and the whole county, where the plant was located. The new production became the cargo department of Vauxhall. 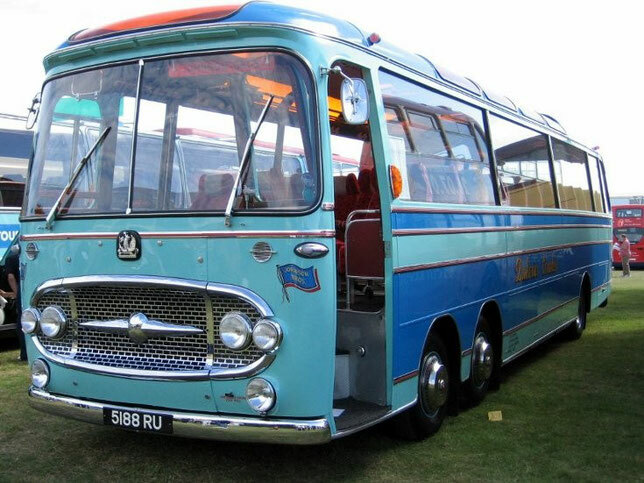 Reliable and high-speed machines "Bedford" were a great success and soon became popular on all types of transportation. So the motto of "Bedford" appeared: "You see them everywhere", which was quite true. The first appeared 2-ton machines "WHG" and "WLG" with a wheelbase of 3330 and 3990 mm. Respectively, which cost extremely cheap - only 198 pounds sterling; Followed by the release of light vans "VY" and "VX", a 1.5-tonne series "WS" and 3-ton trucks "WT". They were equipped with a 6-cylinder top-hat gasoline engine (3177 cm3, 44 hp, on the "WT" series - 64 hp), a rare 4-speed synchronized transmission in Europe at that time. The first "Bedford" of its own design became in 1934 a light van "BYC" with a load capacity of 600 kg., Recognized by contemporaries as the best delivery vehicle of its class. Later, on a chassis Vauxhall, in parallel produced a whole family of light wagons and pickups of the series "AS", "NS" and "JC" for 250-600 kg. Cargo. In 1939, Bedford introduced three new series of 2-axle hooded cars "K", "M" and "O" with a more modern appearance: the flat radiator facings and rectangular cabs gave way to rounded lines and streamlined shapes. The first consisted of machines with a carrying capacity of 1.5-2 tons with a standard wheelbase of 3050 m. The "M" series with a carrying capacity of 2-3 tons was offered with two wheelbase dimensions of 3050 and 3630 millimeters. The greatest popularity was given to the machines of the "O" series with a carrying capacity of 3-5 tons, produced in 13 variants with two wheelbase dimensions. Using the American principles of unification and standardization, they were equipped with the same 6-cylinder engine with an increased to 72 hp. Power, a mechanical 4-speed gearbox, one type of rear drive axle, the same spring suspension and hydraulic brake. Only on models with a carrying capacity of more than 3 tons was applied the vacuum amplifier of a drive of brakes. Have not yet had time to launch a mass production of these machines, as they had to urgently alter them into army variants. The main series was "O", on the basis of which trucks were produced models "OXD", "OYD" and "OWS" with a payload of 1.5-5 tons, which received a specific flat front cover, which became their unique identification mark. The most famous army version of the "M" series was a light pick-up "MWD" with a carrying capacity of 750 kilograms. Since 1941, Bedford has produced a 3 tonne QLD (4 × 4) model with a cab above the engine and an 8-speed transmission. At the end of the war, civilian pre-war vehicles began to go off the assembly lines of Bedford again. On the chassis of the Vauxhall 14NR passenger car, a JCV van was produced with a payload of 500 kg, and only a 1.5-ton version of KD remained from the K series. Gammu "O" was divided into two groups - "OLA" and "OLB" with a payload of 3-4 and 5 tons, respectively. Also offered a short-base semitrailer tractor "OSS". In 1947, a 500,000-ton truck came down from the Bedford conveyors. In 1950, there was the first new development - the so-called "Big Bedford" (Big Bedford) - 7-ton truck series "S" half-hood configuration with a very elegant for its time rounded cab with chrome radiator lining. Three years later this range was offered in 4 versions: the onboard models "SSZ" and "SLZ" with wheelbase of 2.9 and 4 meters, respectively, the truck tractor "SA" with a base of 2.2 meters, the full-drive truck "R" ( 4 × 4). They used a in-line 6-cylinder diesel (4927 cm3, 110 hp), a 4-speed transmission, a hydraulic brake drive with a vacuum amplifier, a hypoid main gear. Cars developed a speed of 80 km / h. In 1953, the series "O" was replaced by a new hood 76-strong gamma "TA", consisting of numerous models with a carrying capacity of 1.25 - 5 tons. In 1952, there seemed to be an inconspicuous event in the activities of Bedford - in its program for the first time appeared a specially designed light van "SA" half-hood configuration with a carrying capacity of 500 - 750 kg., Featuring a peculiar appearance. The car with a wheelbase of 2286 millimeters received an all-metal, mounted on the frame frame, a body with a capacity of 4.6 m3 with a side sliding door (a rarity at that time) and flaps covering the niches of the rear wheels. It used an upper-valve engine with a working volume of 1507 cm3 and a power of 40 hp. From the popular car series "Wyvern" (Wyvern), synchronized 3-speed gearbox, front independent lever-spring suspension. It was a huge success in urban transport and was produced for about 20 years. In 1958, the hood series "TA" was replaced by a new "TJ", the design of which was made in the same style. The range consisted of unified models from "TL" to "TJ6" with a carrying capacity of 1.75-6 tons. A special feature of the "TJ" series were special vans with a carrying capacity of 1.5-1.75 tons and a capacity of up to 13.5 m3 with a cabin above the engine. It was such a machine in 1958 that received a 1-millionth serial number. 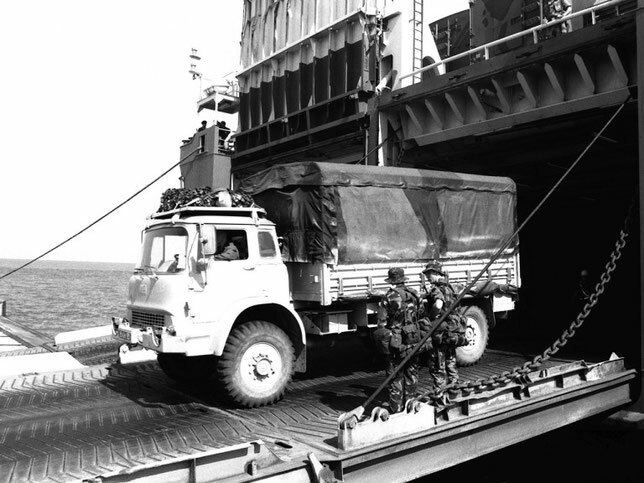 In 1960, to replace the "S" series, a fundamentally new range of "TK" with a carrying capacity of 3-7 tons with a forward extended elongated and low-lying cabin was introduced. In its rear part was located the engine capacity of 98-138 horsepower. Subsequently, the full mass of cars in this series was increased and amounted to 5.5 to 12 tons. It also included numerous special designs with a wheel formula from 4 × 2 to 6 × 6 and a base of 2500-4950 millimeters, designed for distribution purposes or performing particularly heavy work on the ground. In 1966, Bedford introduced for the first time heavy machines of the KM series with a total mass of up to 24 tons with a new diesel engine with a capacity of 143 horses. 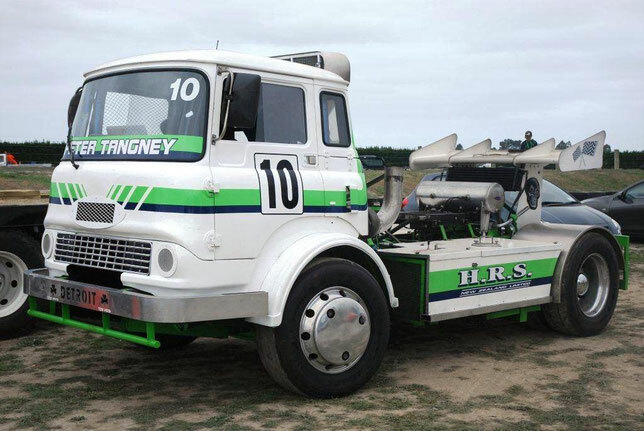 Two years later, a version with a wheel formula of 6 × 2 appeared, and in 1972 a truck tractor for working as a part of a road train with a gross mass of 32 tons. By this time, the influence of internal cooperation among members of the concern "General Motors", including the European branch of Opel and partly owned by the Japanese firm Isuzu, became increasingly felt in the design of British cars. In parallel, the improvement of light trucks continued. In 1964, based on the popular small cars "Vauxhall Viva" (Viva), the production of vans and pick-up trucks "HA" with the carrying capacity of 300-500 kilograms began. In 1969, the well-known series "SA" replaced the gamma "CF" with a payload of 900 kg. Up to 1.75 tons with diesel engine capacity of 1.8 liters, made in the American style, inspired by Chevrolet. In the early 80's a new series of "CF2" from four models (from "250D" to "350D") with a total weight of 2.3-3.5 tons with a bearing body, a side sliding door and a significantly modified design appeared. Now they were more like typical Western European developments. They used 4-cylinder Voxhall petrol engines (1859 and 2279 cm3) and Opel diesel (2263 cm3, 61 hp, 5-speed synchronized transmission, front disc brakes and independent suspension. Year to the series "TK" added a range of "TL", which was characterized by a more rigorous design and application of the flap over the engine. In 1986, the most powerful representative of this range - a 3-axle dumper "TL2440" (6 × 4) with a total mass of 24 tons - was one of the last cars bearing the brand "Bedford". But, despite the economic backwardness of Great Britain, by 1980 the position of Bedford remained fairly prosperous. On his account, there were already 2 million trucks produced and 1 million different vans. Up to 70% of all products were exported to more than 100 countries. 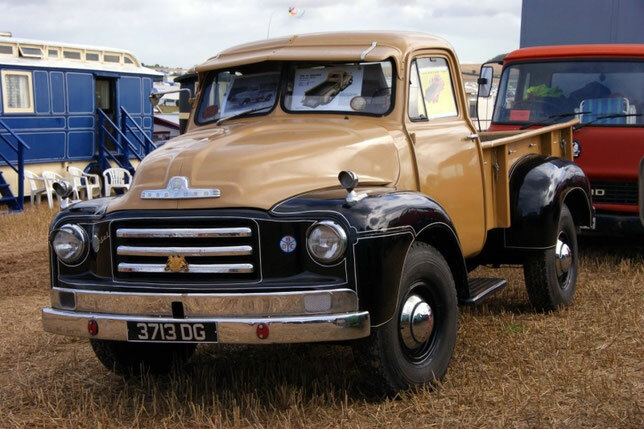 Bedford remained one of the leading manufacturers of trucks in the country. Since 1974, the introduction of heavy scale "TM" for long-distance transportations has begun. It was based on single models "TM1700" (4 × 2) and "TM2600" (6 × 4) with a total weight of 17-26 tons with a wheelbase from 4,070 to 5,230 millimeters and a 2-axle truck tractor "TM3250". In addition to the diesel "Bedford" (8.2 liters, 208 horsepower), they used an American 2-stroke engine "Detroit Diesel" (V6) working volume of 9 liters. And a power of 235 hp, as well as 2-disc clutch, a 9-speed Fuller transmission, leading bridges Rockwell and a front suspension on 2 leaf springs. In 1983, they were added tractors "TM3400" and "TM3800" with a cab with a berth for main transportations on the routes of continental Europe. The most powerful and perfect representative of "Bedford" in its history was the truck tractor "TM4400-8V" (4 × 2) with a new cabin with a flat floor and two sleeping places. It was equipped with a 2-stroke Detroit Diesel V8 turbocharged engine (12 liters, 445 hp), a 13-speed gearbox, a suspension on parabolic springs and disc brakes on all wheels. As part of the road train with a total mass of 38.2 tons, the car consumed 35.3 liters of fuel per 100 kilometers. In the early 80's, there was a dangerous drop in demand and income. In 1985, staff reductions began and it was announced that Bedford had incurred losses of 11 million pounds. By that time, the total losses were 73 million pounds. At the Bedford factories in Luton and Dunstable, a shorter working week was introduced. In the meantime, Bedford tried to expand its program urgently at the expense of more popular trucks. In 1984, under the brand name "Bedford" began production of two light wagons Rascal and Midi, which were copies of Japanese cars "Suzuki Super Carry" (Suzuki Super Carry) and "Isuzu WFR". They were the smallest Bedfords: the first one was 650 kg, and the wheelbase 1840 mm. "Midi" with a payload of 1.1 tons had a total mass of 2.5 tons and Japanese gasoline and diesel engines (1817 cm3, 76 hp and 1995 cm3 56 hp). 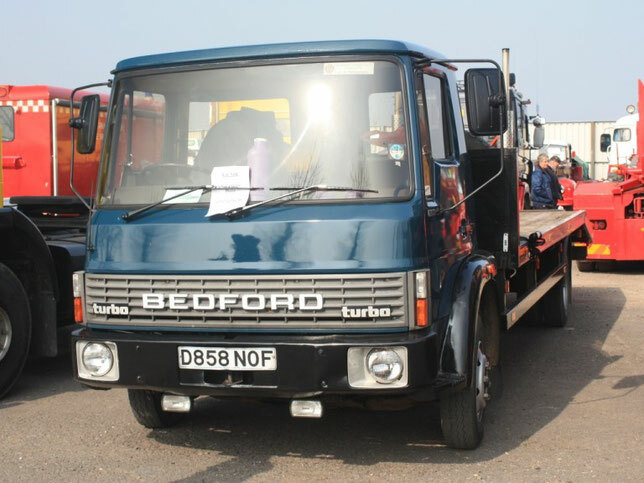 The new products did not bring the expected salvation, and the production of all Bedford trucks began to decline inexorably until the release of most of them was stopped. In 1986, I had to take a painful decision to leave Bedford from the heavy truck market. In November 1987, for water in Dunstable, along with the rights to the produced range of trucks bought; The firm "All Wheel Drive Limited" (All Wheel Drive Ltd. - abbreviated AWD). She managed to continue the production of 2 and 3-axle machines of the series "TL" and "TM under the brand" AWD "for only 6 years, after which she went bankrupt. In 1992, the "Bedford" brand was revived by the engineering group "Marshall" from Cambridge, which made truck production its new branch. There is a family of "RL full mass of 13-26 tons, equipped with 6-liter diesel engines" Perkins "(Perkins) power from 130 to 300 horsepower.